The Old Vic residential nursing home in Kettering celebrate Mothers Day in style! 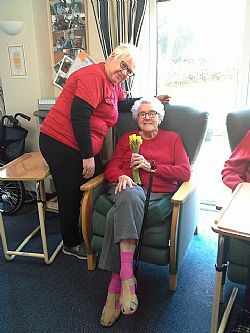 Each and every one of our mothers at The Old Vic residential nursing home in Kettering receive a bunch of spring flowers on Mothering Sunday. To celebrate Mother’s Day our lovely ladies are presented with beautiful daffodils before they enjoy a traditional Sunday lunch. The staff at our gold standard nursing home in Northamptonshire are always keen to encourage and welcome visitors on Mother’s Day to join their loved ones for lunch, afternoon tea or dinner. We have plenty of space for all our mum’s to be surrounded by their families, our cosy lounge at the front of The Old Vic is welcoming and spacious and we have two other lounge areas and fantastic gardens for our residents and their guests to enjoy.